Dolphin or Shark…Time for Concern? This article is an excerpt from a previously released Sidoxia Capital Management complimentary newsletter (March 1, 2016). Subscribe on the right side of the page for the complete text. Through the choppy stock market waters of February, investors nervously tried to stay afloat as they noticed a fin cutting through the water. The only problem is determining whether the fin approaching is coming from a harmless dolphin or a ferocious shark? The volatility in 2016 has been disconcerting for many, but a life preserver was provided during the month with the Dow Jones Industrial Average up a modest 50 points (+0.30%). Recession? Overall corporate profits have slowed in the face of plummeting energy prices and the headwind of a strong dollar. However, corporate profit margins remain near record levels and if you exclude the decline in the troubled oil patch, core profits keep chugging along. If an imminent recession were actually on the horizon, you wouldn’t expect to see a 4.9% unemployment rate (8-year low); record auto sales; an improving housing market; and stimulative national gasoline prices at $1.75/gallon (recent recessions have been caused by high energy prices). Negative Interest Rates: Would you like to get paid to borrow money? With $6 trillion dollars of negative interest rate bonds in the market (see chart below), that’s exactly what is happening. Just imagine walking into your local Best Buy, and asking the salesman, “Can I borrow $2,000 to buy that big screen TV there…and oh by the way, can you pay me interest every month after you give me the money?” Scary to think many people are panicked over the stock market when they should be more alarmed over negative interest rates. Would you rather earn 6.4% on the average stock (S&P 500 earnings yield) and a 2.2% dividend yield vs negative interest rate bonds? As I always caution investors, even though interest rates are at/near a generational low, diversified portfolios still need exposure to bonds, even if you’re at/near retirement because of the stability they provide. Bonds act like expensive pillows – they are necessary to sleep at night. Although some observers point to negative rates as a sign of a global collapse, low inflation, aggressive foreign central bank monetary policies, and a lingering risk aversion hangover from the 2008-09 financial crisis probably have more to do with the current strange status of interest rates. Political Turbulence: Uncertainty abounds in another election year, just as is the case every other four years. As we head into Super Tuesday, the day in the presidential primary season when the largest number of states hold primary elections, the Republicans are set to battle for approximately half of the delegates necessary to secure the party nomination. The Democrats will be competing for about one-third of the delegates. While many individuals are placing paramount importance on the outcomes of the presidential elections, history teaches us otherwise. The ultimate person elected as president will certainly have a significant impact on the direction of the country, but there are other contributing factors as important (or more important) to economic growth, including the Federal Reserve, and the two houses of Congress. On numerous occasions, I have pointed out the irrelevance of presidential politics (see also Who Said Gridlock is Bad?). 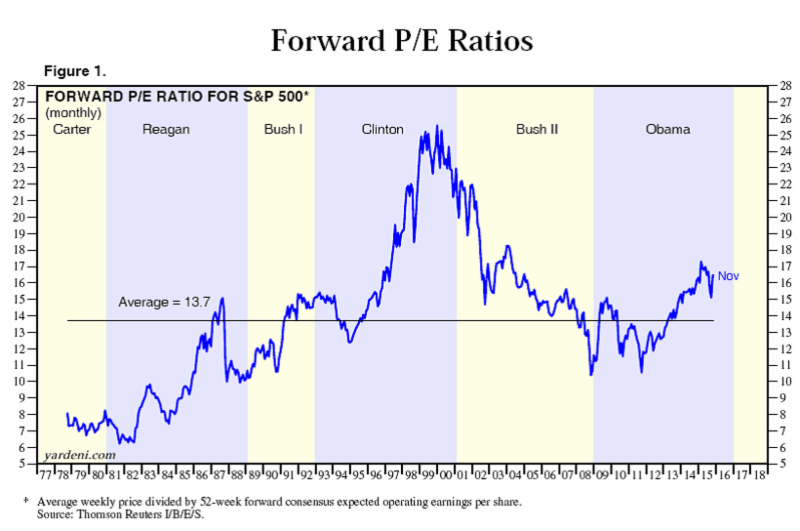 As the chart shows below, the past confirms there is no consistency to stock market performance based on political party affiliations. Stocks have performed strongly (and poorly) under both party affiliations. Brexit? After lengthy negotiations with EU leaders in Brussels, Britain’s Prime Minister David Cameron set June 23rd as the referendum date for voters to determine whether Britain stays in the European Union. 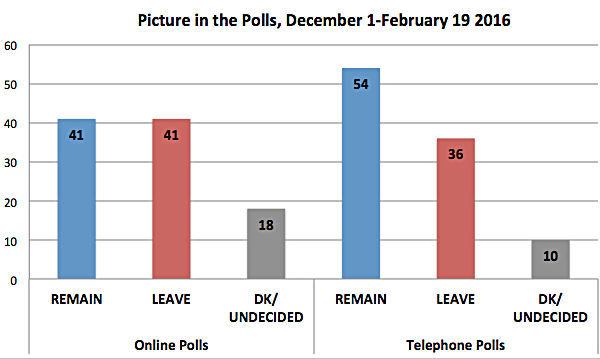 Opinions remain divided (see chart below), but we have seen this movie before with Greece’s threat to leave the EU. As we experienced with the Greece exit (“Grexit”) drama, calmer heads are likely to prevail again. Nevertheless, until the end of June, regrettably we will be forced to listen to continued Brexit fears (see also Brexit article in the Economist for a more thorough review). Collapsing Oil Prices: The violent decline in oil prices over the last few years has been swift from about $100/barrel to $34/barrel today. However, the economic slowdown in China, coupled with a stronger U.S. dollar, has led to a broad downfall in commodity prices over the last five years as well. As much as declining demand has hurt commodities and been stimulative for buyers, over-building and excess supply has pressured prices equally. Fortunately, there are signs commodity prices could be in the process of bottoming (see CRB Index). Financial market volatility in early 2016 has frayed some nerves, and the appearance of swirling fins has many investors wondering whether now’s the time to swim for shore or remain calm and catch the next growth wave. Despite the concerns over a potential recession, negative interest rates, bitter politics, Brexit fears, and depressed oil prices, our economy keeps slowly-but-surely powering forward. While U.S. corporations have been negatively impacted by a strong currency, compressed banking profits (i.e., lower interest rates), and a weak energy sector, S&P 500 companies are rewarding investors by returning a record $1 trillion in dividends and share buybacks (up from $500 million in 2005). When swimming in the current financial markets, you will be better served by swimming with the harmless dolphins rather than panicking over imaginary sharks. DISCLOSURE: Sidoxia Capital Management (SCM) and some of its clients hold positions in certain exchange traded funds (ETFs), but at the time of publishing had no direct position in BBY or any other security referenced in this article. No information accessed through the Investing Caffeine (IC) website constitutes investment, financial, legal, tax or other advice nor is to be relied on in making an investment or other decision. Please read disclosure language on IC Contact page. Entry filed under: Themes - Trends. Tags: Bexit, commodities, negative interest rates, oil prices, Politics, recession.